Now, I should warn you that I read this book awhile ago and don't really remember much expect that I hated it. So, I'm about to rant on about the two things that drove me nuts in this book and, without really remembering the whole thing, I may, without meaning to, spoil the book for you. So read with caution. Arbonne is a land ruled by women, both their goddess Rian, and their queen. Yet even in this world, where women should be considered equal, the rules, set down by a woman, are stacked against women. Minstrels are revered, for they spread music across the land, but when one is chased out of the bedroom by a woman who doesn't want him he uses his music to malign and slander her. She and her husband have no choice but to invite this creep back to their manor and lavish attention over him. How revolting, that in a place like Arbonne, there is still no justice for women trying to protect themselves from unwanted suitors. Then there is the land of Gorhaut, ruled by a man newly on the throne, Ademar. Gorhaut has long been at war with a third kingdom, whose name I can't remember, but Ademar had decided this is a war Gorhaut can never win, so he makes peace, handing over land concessions which, as the aggressor, isn't all that unreasonable a solution. His people, on the other hand, see him a monster, cheapening the blood sacrifices they've all made in the name of this war. We're supposed to see him as a monster too, though. Or maybe that comes when he decides to invade Arbonne. Now living in Arbonne is Blaise, a Gorhaut soldier who deserted the country when Ademar made his peace. He's convinced by the Arbonne people it would be best for him, and them, to stake a claim to the Gorhaut throne. To do this, he meets with the king from that third kingdom and gets assurances that the man won't interfere in any way. What I don't get is why that king would agree to anything so stupid? Ademar gave him peace, took his soldiers out of the man's land, and gave him land. So here he is, all but agreeing to support Blaise in his quest for the throne, when Blaise is as opposed to that peace as the rest of Gorhaut. Um, dude, the man you just agreed to help will probably be ripping up that peace treaty and marching troops to take back the land Ademar gave away a week after he gets throne, tops. 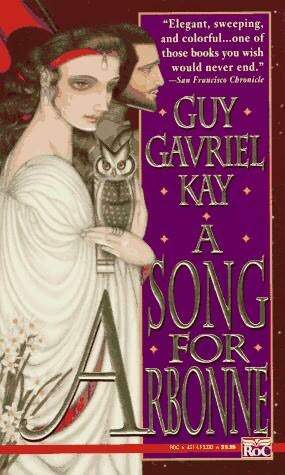 Guy Gavriel Kay is an amazing writer. His plots are never predictable, the endings are always a surprise, and people never end up with who you expect them too. He's not afraid of slash, though he's never all that descriptive. It's mostly people remembering past lovers. There's never really been a slash pairing when the book was all done. For all of that, there were plot holes too ridiculous to ignore in this book. Read Tigana or The Lions of Al-Rassan. Those are Guy Gavriel Kay at his best. This is not.